Imagine that it is orientation week. There is free food everywhere and many parents of freshmen who are almost more excited than the students themselves. Some of these students and parents probably met Matthew A. Ciborowski ’08 during orientation, though they may not have known it. Ciborowski, you see, was dressed as MIT’s friendly mascot, Tim the Beaver. The perpetually cheerful Tim can be sighted at many campus events, with his buck teeth eternally displayed in a chubby-cheeked grin. Ciborowski, however, is not the only Tim out there. He is a member of “Team Tim,” a group of eight students hired by the Campus Activities Complex who take turns being MIT’s mascot. The team was put together last year, according to Phillip J. Walsh, director of the CAC, in part to give Tim a personality. Each student is paid $10 per hour, according to the current Student Employment Office listing advertising for a position on Team Tim. Currently, student groups can either rent out the Tim the Beaver costume (and have someone in the group act as the mascot) or have a member of Team Tim show up to their event all decked out. The only rule is that Tim must stay on campus, according to Smith. In March 2002, the costume was taken off campus to Harvard as part of an attempted hack, which involved simulating a sexual act on the statue of John Harvard. During the prank, Tim’s paw was stolen by a Harvard student. 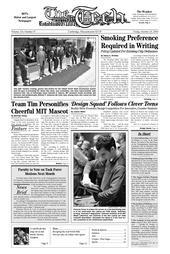 The MIT pranksters were charged $650 by the CAC, the cost of a new set of paws. The paw was later stolen back by an MIT student posing as a reporter for The Harvard Crimson, Harvard’s student newspaper. The idea for Team Tim came from looking at other colleges with mascots, Smith said. Several athletic programs had a group of students who would act as the mascot. Sally E. Peach ’09 (also a Tech photographer) is another member of the team. She has always wanted to be a mascot and said that her most memorable event was the latest “grad rat ceremony.” The graduate students made a “Tim-sized” Brass Rat for the mascot. Tim appears at various campus events, and is sometimes even hired to pass out flyers and pens for the MIT Federal Credit Union. Tim the Beaver is “just a fun-loving guy,” Ciborowski said, who is “definitely not an MIT student because he’s never sad and always has a smile.” Ciborowski said that it is obvious that Tim does not complete problem sets each week. Peach provides a similar view of the MIT beaver. When she puts on the Tim costume, she tries to be “sweet and inviting” and “give people hugs,” while occasionally dancing a little. Being in the actual mascot costume, though, is not as gleesome as Tim appears to be. Peach said that the costume is awkward and is hard to see in. It also gets very hot, Peach said, despite the fact that the costume comes with an ice pack shirt and a fan inside it. The costume is “not as bad as you would think,” Ciborowski said. But the gloves can be “frustrating” because there is only room for four fingers. Another added difficulty, Ciborowski said, is that Tim cannot walk up stairs (Tim’s feet are bigger than a typical stair step) and has to take an elevator or ramp. Typically, members of Team Tim work in pairs, with one student acting as a spotter or handler to help Tim the Beaver get around, according to Walsh. The members of Team Tim have really bonded with each other, Smith said. She said that she hopes the team will have training programs in the future to teach people how to be “effective without saying anything.” Walsh said that hiring mimes to help with the training is a possibility. Other animals originally considered included the kangaroo and the elephant.